Creating and maintaining balance in the 21st century can be difficult. Debts, job prospects, relationship issues all can distract us from following our own paths. The environment, family, friends, co-workers all seek to influence our decisions. Warrior’s of The Millennium is the go-to book to give you the tools to create a healthy, balanced, mindful life. If you are like me, the issue is that the word warrior sometimes evokes a picture of the strong, burly guy that is running around attacking people. Since 2008 when I launched this movement I have worked with dozens of people who felt just like that. In 2015 when the Warrior Within Show first started on WCAS it was due to a conversation between the station owner, Melissa Anderson, The Society of Ancient Sisters and myself. She read my material, and called me. She asked a lot of questions, some of them were difficult for me to answer, and yet, after that conversation she offered me the slot on Friday nights at 9 PM eastern that I am still on every week. In my life, I have had struggles, made mistakes, and taken responsibility for those mistakes. In fact, like you, I still deal with the consequences of every action I have taken in my life. Here is the thing though, I am not a guru, I am just a regular person, who has found a way to be harmonious, balanced, and happy in my life. I struggled with those aspects of myself that were in my shadow. I realized that some of the decisions that I made that seemed right at the time, were not in my best interests. In fact, like everyone else, I am still dealing with the consequences of those actions. Tapping into my Spiritual Warrior has allowed me to make better decisions, and even to be able to mitigate some of the long-standing consequences of my previous actions in order to become a whole person. The person I am now has boundaries, limits, and is happy with my own decisions and interactions with others. 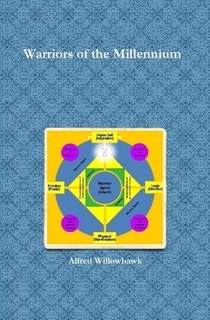 This purchase includes the color plates of the illustrations in the book, a color cover, and a guided meditation by Alfred Willowhawk to assist you in integrating your own shadow and non-shadow for a harmonious existence in this complicated noisy world.